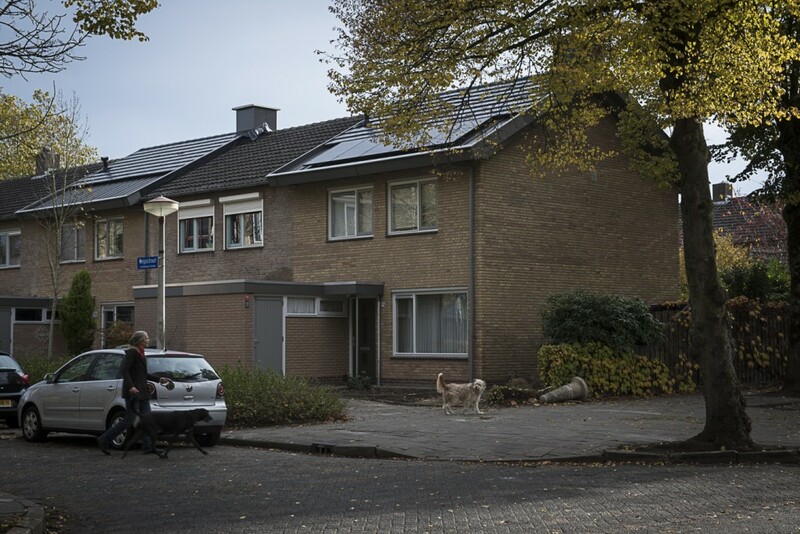 Many houses in Eindhoven’s residential district ‘Eckart-Vaartbroek’ were built in the 1960s and are therefore poorly insulated. 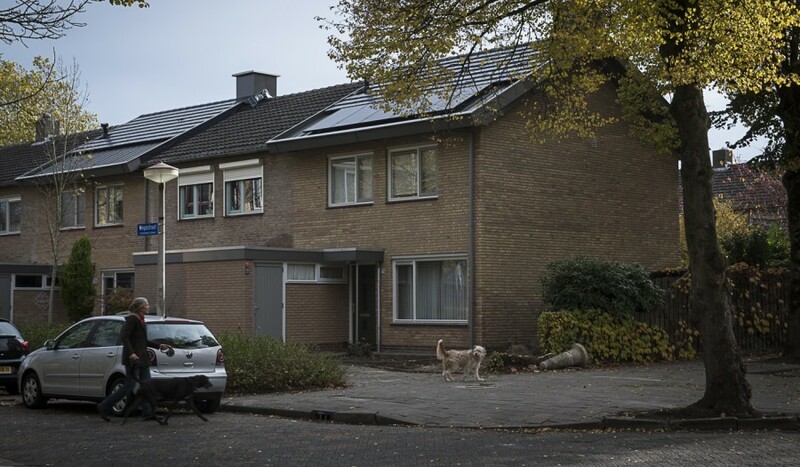 The owner, Woonbedrijf Housing Association, decided to renovate 140 of their houses, including improving insulation and applying solar panels. They are doing the renovations not the usual way – all at once and uniformly. Instead, one home is being renovated at a time according to the wishes of each individual tenant. The first renovations are just being finished now. Usually, the houses of a residential district are all renovated at once and in a uniform way. Woonbedrijf decided to think (and act) outside the box by offering tenants a choice as to which modifications they would like to have done and when they would like the renovation to start. Many of the refurbishments such as a highly-insulated roof and HR++ glazing on every floor are offered as part of the renovation work. These renovations do not result in a rent increase. Other modifications such as solar panels or a larger bathroom will result in a moderate increase in the monthly rent. Either way, it is up to the tenant to decide! Woonbedrijf uses a digital platform called ‘WoonConnect’ (‘LiveConnect’) to help tenants choose wisely: a 3D model shows the effect of certain modifications such as solar panels, roof insulation and extra windows. The digital platform is very user-friendly but Woonbedrijf staff is assisting tenants with the use of the tool if necessary. Still, there is more: WoonConnect created an online survey giving every household the chance to voice their own opinion about topics such as ‘How do you want to live in the future?’, ‘How can you contribute to sustainability?’ and ‘What are the pros and cons of your neighbourhood and your house?’. From 16 through 18 October, representatives from all seven Triangulum workpackages met in Manchester for their fourth General Assembly and their tenth Steering Commitee meeting. The first day of the General Assembly was held at the Manchester Art Gallery – what a great location for a project meeting! The agenda focused on topics such as first results of the monitoring process and information about the progress of ongoing implementations. Each Lighthouse City presented five proposals on how to exploit results, followed by an interactive Q&A session. 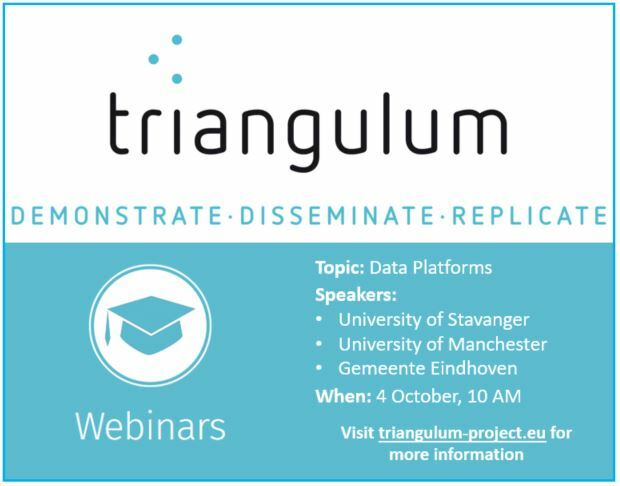 WP6, focusing on replication, then presented successful replication approaches and the question how Triangulum as a project can support upscaling and faciliation. The Follower Cities also talked about their progress and presented some exploitation proposals. In the afternoon of the first GA day, there was a workshop organised by WP6 about “Boosting Replication in Follower Cities”. The day continued with two site visits to either Clicks&Links for a visualisation demo or to Manchester’s Last Mile Delivery Depot. Of course, the evening was rounded off with a traditional dinner and some typical British menu options to choose from. For the second day, we moved to the Manchester Metropolitan University where we learned more about dissemination and communication activities, some important upcoming events such as the Barcelona Smart City Expo & World Congress and about the current status of the project management. Because of the new GDPR law that came into effect at the end of May 2018, the entire team took part in a GDPR compliance workshop organised by the University of Manchester. It was a great and very productive meeting! Thank you Manchester and thank you to the City Council of Manchester and all our involved partners for hosting this project meeting. 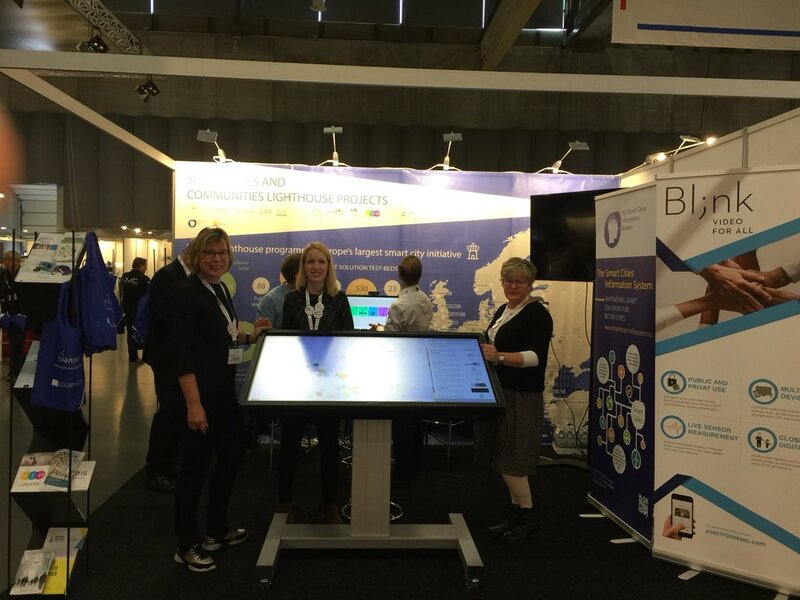 From 25-27 September 2018, the fourth Nordic Edge Expo & Conference took place in our Lighthouse City Stavanger, Norway. The Nordic Edge is an annual event showcasing the latest innovative solutions from the Smart City community and thus the ideal meeting place for the project partners of the Horizon 2020 Smart Cities and Communities programme. 4500 visitors from all across Europe and even beyond attended this three-day event to present outcomes, exchange knowledge and meet with project partners. 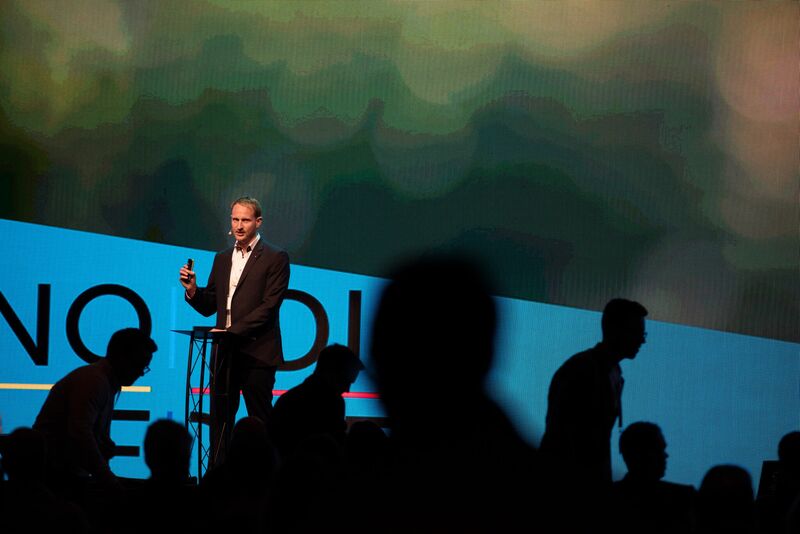 Apart from the official event, several side-events were organised around this largest Smart City event in the Nordics. 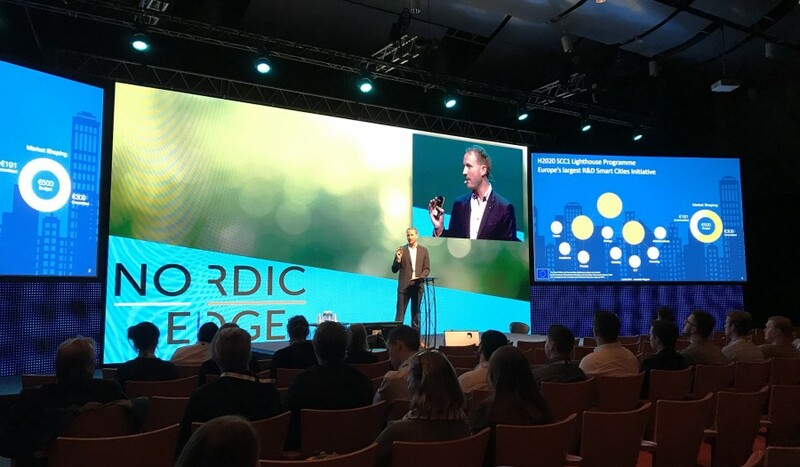 “Smart with a Heart” was the theme of this year’s Nordic Edge Expo and Conference. To us, the EU-funded Horizon 2020 Smart Cities and Communities (SCC1) projects, being smart with a heart has many different meanings. But mostly, it’s about working together and about seeing the person behind as well as in front of the technology – that is, both project and city representatives as well as the citizens living in Smart Cities. And that’s why the Nordic Edge was such a special event this year. Because it gave project coordinators, universities, technical partners, municipalities, but also investors and decision makers the chance to meet like-minded people with the same enthusiasm at heart. 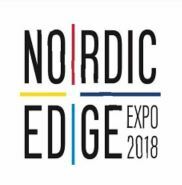 The Nordic Edge Expo with 2500 m2 of exhibition space and 200 exhibitors from more than 47 countries is the place in the Nordics for the Smart City community to exchange knowledge, network and create new business opportunities. During all three days of the exhibition, Triangulum was thus, together with the other 11 SCC1 projects, represented with a joint stand. The stand featured all 12 Lighthouse projects (Triangulum, Remourban, GrowSmarter, Replicate, SharingCities, SmartEnCity, SmarterTogether, mySMARTLife, Ruggedised, IRIS, MAtchUP and STARDUST) as well as the two tenders Smart City Information System (SCIS) and the European Innovation Partnership on Smart Cities and Communities (EIP-SCC). There, project, tender, city and technical representatives had the chance to meet each other, to talk to and inform visitors about the overall SCC1 community, the individual projects and the solutions developed therein and to illustrate the progress that we have made via the joint SCC1 Multitouch Tool that hosts information about all SCC1 projects. 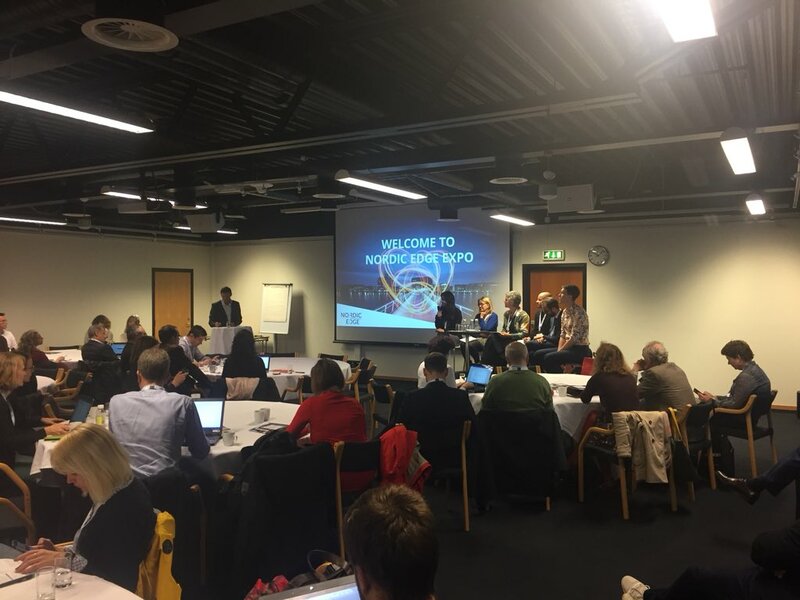 The main SCC1 contribution to the Conference took place on Thursday, 27 September: the “Lighthouse Cities Programme”, an entire day of six public and five internal parallel sessions focusing on the challenges and outcomes of the SCC1 projects. The public session “Trial, Innovate, Scaling Up. Lessons learned from Europe ‘s Smart City Lighthouse Projects in a European Context”, moderated by the European Commission’s DG Energy Policy Officer Jens Bartholmes, informed about first results and lessons learned from the projects. Four project coordinators of SCC1 Lighthouse projects talked about first results and lessons learned: our project coordinator, Damian Wagner of Fraunhofer IAO, Nathan Pierce of Greater London Authority (SharingCities), Lisa Enarsson of the City of Stockholm (GrowSmarter) and Elisabeth Jorge Pascua of Donostia San Sebastián (Replicate). Another public session focused on hands-on stories from the City Coordinators of Vienna, Milano, Nottingham, Cologne, Stavanger (Gerd Seehuus from our Lighthouse City was there!) and Tartu. With the title “Communication – How to make «invisible» projects visible”, communication representatives of various SCC1 projects, Lighthouse – and Follower Cities presented their findings from their prior internal workshop to the public as well. Moderated by facilitator Josh Stinton (Outspire), the results of the internal discussions were graphically illustrated – putting a lot of heart into it – by Kristof Braekeleire and then pitched to the public by the individual project or city representatives. First outcomes and success factors of the first three SCC1 projects were discussed in a special session as well, featuring, amongst others, Dr. Kelly Watson from the University of Manchester and Wouter Beelen from VolkerWessels Eindhoven. Dagfinn Wage from Lyse, Stavanger was invited to talk about “packaging” and financing solutions for European Smart Cities during the public session on “Business Models and Finance”. And last but not least, Dr. Kelly Watson from the University of Manchester furthermore talked about how citizens are involved in the development of urban data platforms during the “Big Data” public session. Moreover, the SCC1 community was deeply involved in the Conference’s plenary sessions. Our project coordinator Damian Wagner of Fraunhofer IAO talked about the progress of the first three SCC1 projects (Remourban, GrowSmarter and Triangulum) and how cities are paving the way towards a European Smart City market place in his talk “Trial. Innovate. Scaling Up!”. 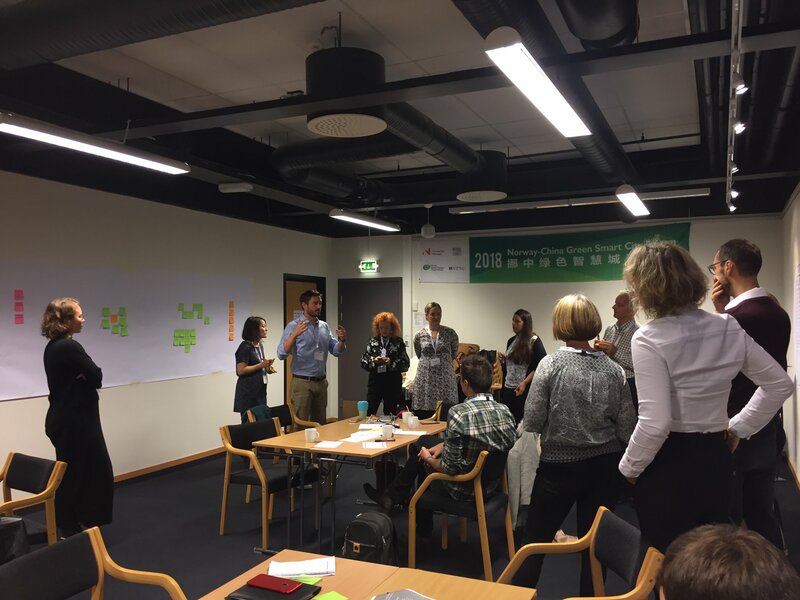 Anna Lisa Boni, the Secretary General of EUROCITIES, project partner of SharingCities and SCIS, discussed with the Mayors of Stavanger, Eindhoven and Tampere (amongst other politicians) how to connect with our citizens´ dreams when building smarter cities. 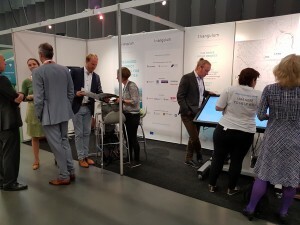 The yearly session “Meet the New Lighthouse Cities“, this time co-organised by EUROCITIES, Greater Stavanger and Stavanger Region European Office, introduced the latest SCC1 projects IRIS, MAtchUP and STARDUST. The session was rounded off with a replication workshop focusing on the question “What can we do together for successful replication?”. 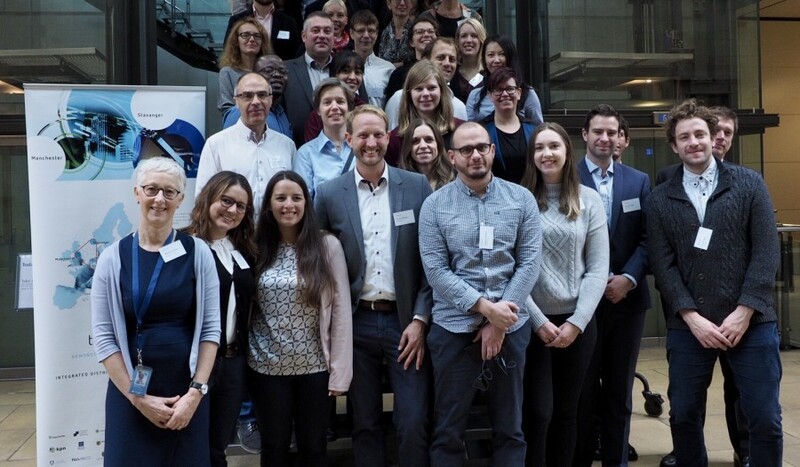 The workshop consisted of two parts: a replication part chaired by EUROCITIES and a community engagement part chaired by Steinbeis-Europa-Zentrum. During intensive internal task force meetings, the SCC1 community talked about joint activities and shared challenges. Representatives of the SCIS consortium were actively involved and discussed cooperation possibilities as well as collaborative work between the individual projects and the tender. At the subsequent SCIS Project Coordinators Meeting, representatives of FP7 projects such as R2CITIES, CITyFiED, CITY-zen and EU-GUGLE joined to exchange experiences. 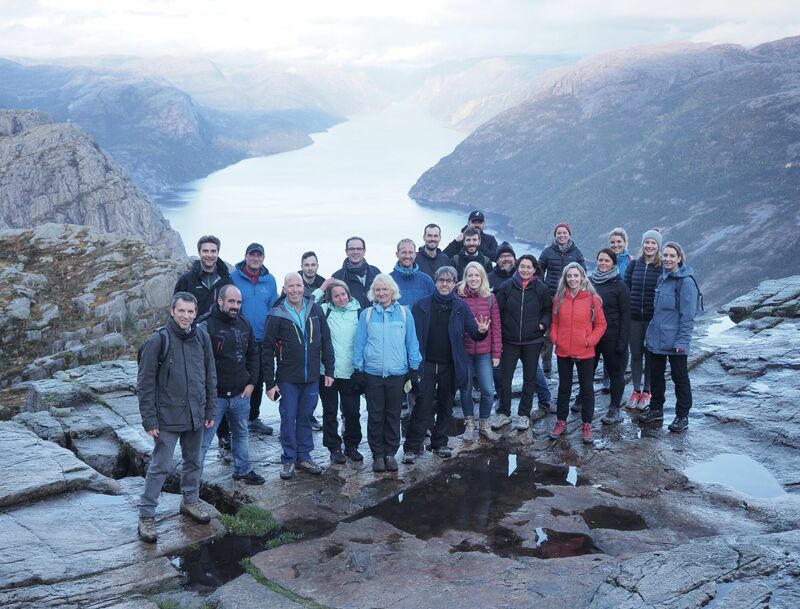 Apart from the official Nordic Edge programme, the SCC1 community used the presence of so many representatives to take part in various other joint activities. 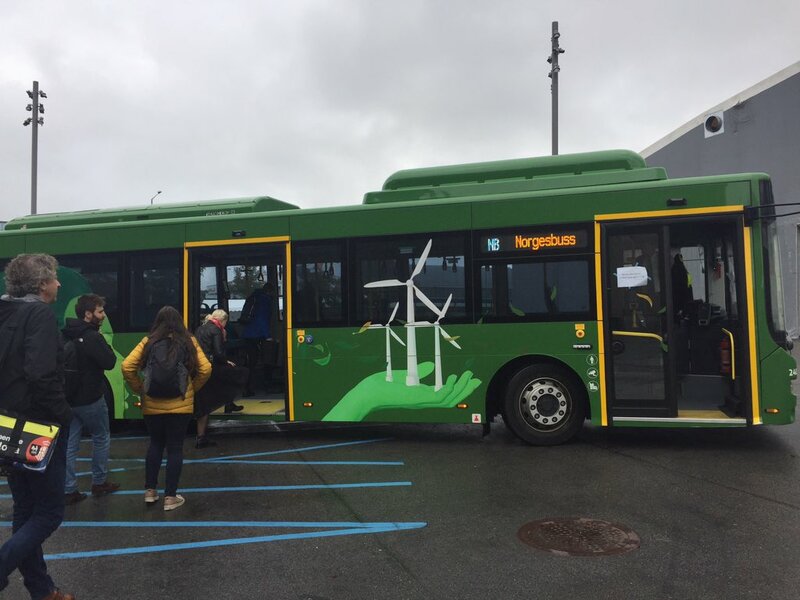 During the “Stavanger Safari”, a demo site visit organised by Stavanger Kommune, an electrical battery bus took the SCC1 community to LYSE. During the ride, a representative of Rogaland Fylkeskommune talked about the implementation process of these busses that worked closely together with the citizens of Stavanger. At LYSE, the group learned about smart lampposts, fast chargers, PV cells and the sewage tunnel of Stavanger’s Central Energy Plant. The Safari ended with a visit to University of Stavanger, where the group was introduced to their Big Data Hub and listened to a presentation of their dashboard solution. The day was rounded off with an informal Get Together at the Stavanger Art Museum. 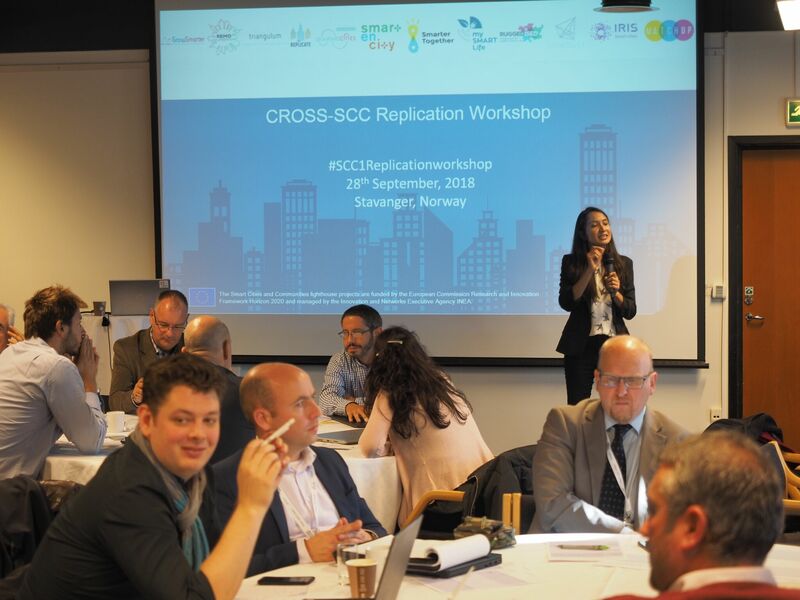 On Friday, the “CROSS-SCC Replication Workshop” was taking place, a session for fostering replication and upscaling of Smart City solutions amongst the SCC1 Community. Over 70 participants discussed topics such as low energy districts, integrated infrastructure, urban mobility and urban governance. During two rounds of round table sessions, participants for example discussed the urban mobility topics “E-Buses & EV Charging Infrastructure”, “Bike Sharing Systems” and “Last Mile Delivery”. The outcomes of all round tables were presented during a short summary at the end. 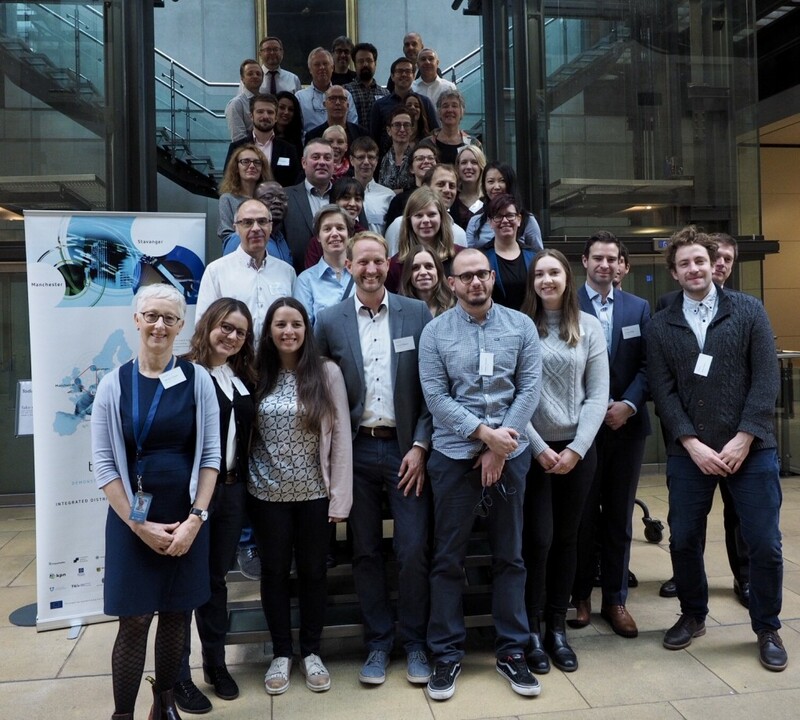 The workshop was organised by the SCC1 Replication Task Group in collaboration with INEA, the European Commission and SCIS and supported by Morgenstadt and the Nordic Edge. The cherry on top of this eventful week was a hike to Preikestolen to enjoy the view down into the Lysefjord. A group of about 30 SCC1 representatives put on their hiking boots and climbed up the pulpit rock. 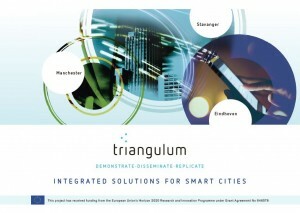 Triangulum has published a brochure presenting the current status and latest outcomes of the project! Printed versions are distributed at various events where Triangulum representatives are present. 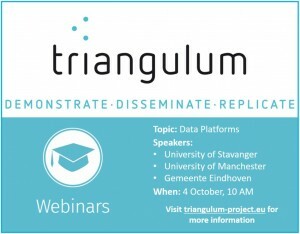 On 4 October, 10 AM (CEST) , Triangulum is hosting a webinar about “Data Platforms”. Join us to learn more about the current status of Data Platforms in our three Lighthouse Cities Stavanger, Manchester and Eindhoven. Hear about specific use cases, such as Manchester-I or Stavanger’s Cloud Data Hub. The speakers will present their main challenges and lessons learned and provide valuable information that might help you with your own city’s data platforms! We are delighted to announce that Triangulum’s Lighthouse City Manchester’s project partners Siemens (Siemens Energy), Manchester Metropolitan University (ManMetUni), and the Manchester City Council (ManCityCouncil) have been shortlisted in the Public Building Energy Project category of the 2018 EnergyAwards! 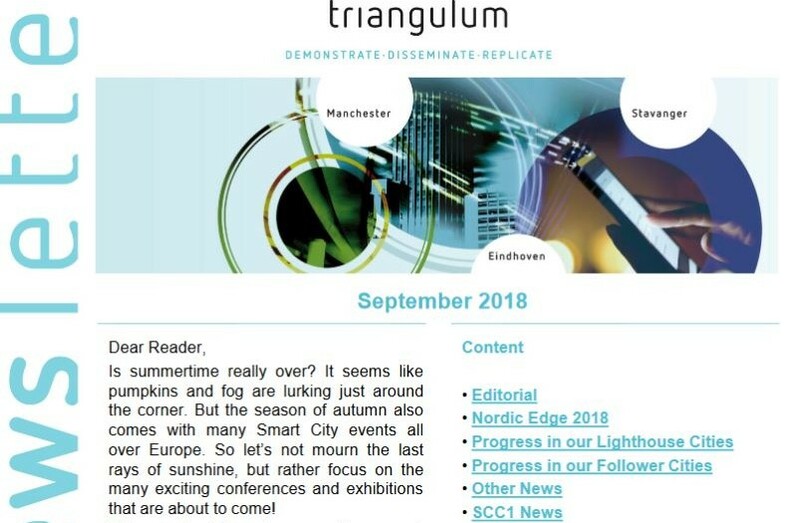 Triangulum’s ninth newsletter is online – updating you about the latest project activities. This time with a special section about next week’s Nordic Edge. Just a few weeks ago, we were enjoying sunny beaches or discovering new places. Now, it is already September and we all know what this means: Summer is over and it’s finally Nordic Edge time! This year, it is already the fourth time that Smart City experts, project and city representatives, the European Commission, smart technology providers, start-ups and universities are gathering in Stavanger, Norway to visit and participate in the most significant Smart City event in the Nordics. Starting with 500 participants in 2015, the conference and exhibition has attracted over 4.500 visitors in 2017! So don’t miss this year’s Nordic Edge and be one of thousands of visitors following the announcement “Smart with a heart”! The theme emphasises the quest that Smart Cities and societies are not only about technical advances and energy efficiency but also about people – the citizens that live and work in the urban environment. It is also about citizen engagement, a crucial precondition to ensure the continuous development of a Smart City even beyond the end of EU funded projects. To Per Fjeld, Project Manager in the Research, Development and Innovation department of our project partner Lyse AS, “it is about passion and health and about the fact that smart solutions are not created solely by tech nerds!”. Katelien van den Berge, Deputy Coordinator of Stavanger and thus deeply involved in the organisation of the event, emphasises that “we should all keep thinking with our heart as well”. Nordic Edge is always a special event for Triangulum, not least because it is taking place in one of our three Lighthouse Cities but also because project partners such as Lyse AS, Stavanger Kommune or Greater Stavanger are some of the founding mothers of the event. As the hosting city, Triangulum‘s Stavanger partners have always played a crucial role in the organisation of the event. This year, Triangulum for the first time functions as the chair of the SCC1 Board of Coordinators as well as the Communication Task Force, which means that we have been putting all our forces together to make Nordic Edge an exciting event! In line with this year’s theme, the SCC1 group has put all their hearts into the organisation of the event. And the results are impressive: The SCC1 group is contributing to Nordic Edge 2018 with an entire day dedicated to the Horizon 2020 Smart Cities and Communities Lighthouse projects, a joint booth at the exhibition area, internal SCC1 task force meetings, a city visits to Stavanger’s demo sites, an informal SCC1 get together, several side events such as replication workshops or pitching events for startups (organised by the city network Morgenstadt) and much more. However, what’s most valuable about all this is the fact that “we have created a platform for all Lighthouse- and Follower Cities as well as other project partners to meet and get into exchange with each other. And this time, not only on project coordinators, but also on executing level, which is really the “heart” of a project”, as Katelien van den Berge has put it. You see, we keep coming back to the theme of this year: Smart Cities are about being smart with a heart. As one of the “senior” projects, Triangulum will be involved in various sessions. The implementation phase of our project has ended and for more than six months now, we have already been monitoring the outcomes of our three Lighthouse Cities. Eindhoven, Manchester and Stavanger have been working on various case studies with smart solutions that are now ready to be replicated in Follower and other interested cities. For sure, the focus of the three first SCC1 projects GrowSmarter, Remourban and Triangulum now lies on providing first outcomes and impact data as well as lessons learned for their fellow SCC1 projects and interested replicators to pave the way for a continuous development of smart cities way into the future. So join our group of 12 Horizon 2020 SCC1 Lighthouse projects with currently 78 cities involved at this special event: meet us, talk to us and learn from our experiences regarding topics like replication, big data, business models & finance and how to best communicate these results to the outside world! The projects will present first outcomes and solutions from their Lighthouse Cities as well as talk about the progress in their various Follower Cities. The special H2020 SCC1 day is taking place on Thursday, 27 September from 9 am to 4 pm. 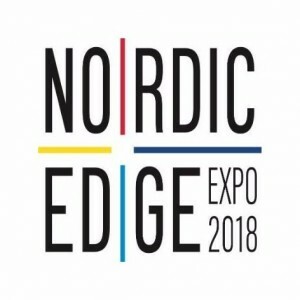 For an overview of sessions and workshops (both public and internal), please check out the official Nordic Edge website or the Triangulum events section. Moreover, come and visit us at our joint booth where, together with the Smart Cities Information System SCIS and the European Innovation Partnership on Smart Cities and Communities (EIP-SCC), representatives from all SCC1 projects such as work package leaders, project coordinators, technical, city or communication representatives are waiting for your arrival! If you ever wanted to really get in touch with a Smart City project partner to ask specific questions or exchange certain thoughts, this is your chance. Need an ice-breaker? How about discussing with Per Fjeld, who will be there in Stavanger on Tuesday already, whether it is time to have a critical and somewhat humorous look at the term “smart”: “Is the term outdated as the cities move on?” And really, “Who wants to be a dumb city?”. So don’t wait any longer, come visit us in the exhibition area and get answers to your questions! 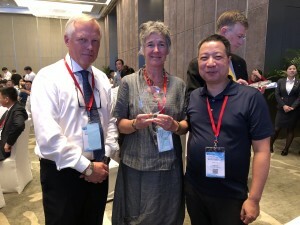 At the beginning of September, Stavanger received an award as “Future City” in Ningo, China. The prize is being awarded to cities that have shown that they dare to be leaders in testing new, sustainable solutions. 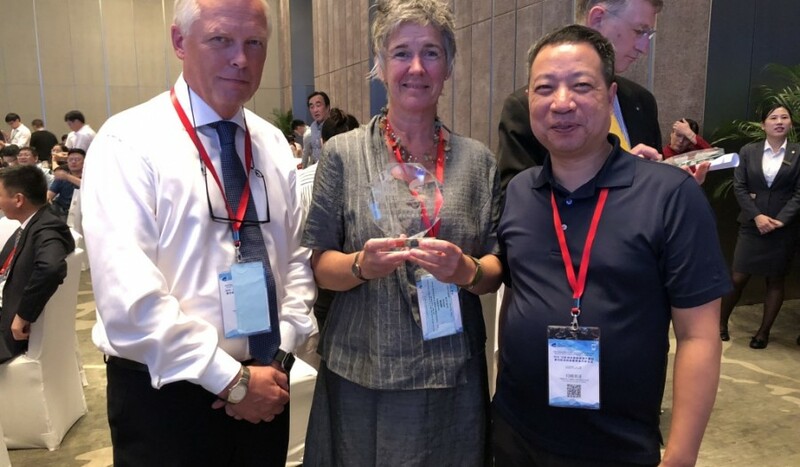 Gerd Seehuus, Local Coordinator of Triangulum Stavanger, Project Manager Per E. Fjeld from Lyse AS and Professor Chunming Rong from University of Stavanger travelled to the Chinese friendship city Ningbo to receive the prize. “This is an important acknowledgment of Stavanger’s partnership and shows that cross-sectoral and academic cooperation is necessary to solve the challenges in the cities. A project like Triangulum is very educational and valuable to the partners, the city and the whole region”, says Seehuus. “To receive an award for being a “future city” fits well into the city’s vision of taking a lead and creating the future together, and it is gratifying to see that through solving complex tasks in an integrated way, we have demonstrated that,” she further emphasizes. The prize has been awarded for the third time by The Foundation Prospective and Innovation, headed by former French Prime Minister Jean-Pierre Raffarin. 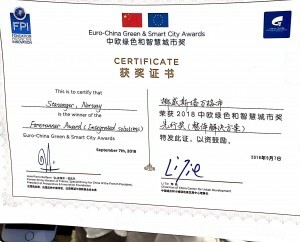 The prize, the Euro-China Green and Smart Awards, is awarded in cooperation with the European Commission and the China Center for Urban Development Prize. In the explanatory memorandum, it is stated that Stavanger has especially excelled within energy efficiency and mobility in Europe. The nomination committee also writes that the city’s ambitious goals for sustainability in the local community stand out. Stavanger’s Mayor Christine Sagen Helgø welcomes the recognition and congratulates the local partnership, Stavanger municipality, Lyse AS, Rogaland County Municipality, University of Stavanger and Greater Stavanger for the award. “Triangulum has given us positive ripple effects far beyond what we expected when the project started in 2014. The partnership in Triangulum has helped put Stavanger on the map internationally as a Smart City,” says Mayor Christine Sagen Helgø. Heidi Kristina Jakobsen, head of the Stavanger Region’s European office in Brussels, congratulates Stavanger on the award as well. Jakobsen says that Stavanger is not only ambitious, but they are also brave and forward-looking. 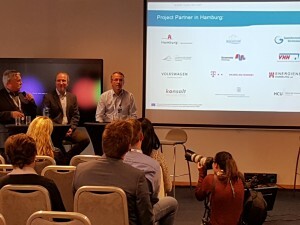 When the idea was launched of ​​seeking funding for the Triangulum project during the EU’s prestigious four-year city announcement (in the EU’s Horizon 2020 Research and Innovation Program), Stavanger municipality and other partnerships seized the opportunity with both hands. “The status as a Lighthouse City is a quality stamp that opens doors to EU institutions and attracts new cooperations and project opportunities. It is no coincidence that European networks such as EUROCITIES, ERRIN, POLICE and ENOLL all come to Stavanger to contribute to the Nordic Edge this year”, said Jakobsen. Stavanger and Ningbo have cooperations that date far back in time. The cooperation agreement with Ningbo aims to strengthen the local business community, research communities, and universities of the two cities. However, it is a coincidence that the prize will be awarded in Ningbo this year. This is the first time a delegation from Stavanger has returned to the friendship city since the World Expo in 2010. Meetings with Ningbo municipality show that it is useful to resume contact for cooperation and experience development in several areas in the future. 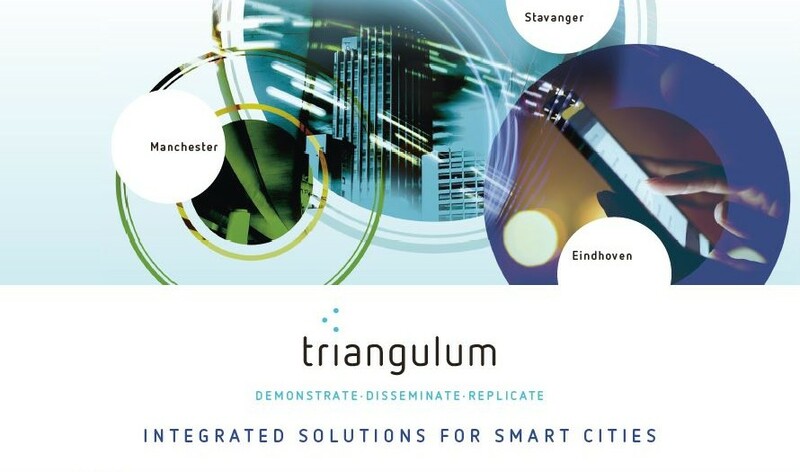 In October 2014, Stavanger became a European Lighthouse City with Eindhoven and Manchester through the Horizon 2020 funded Triangulum project. The Lighthouse Cities of Triangulum will integrate energy, mobility, and ICT into new solutions that have not been shown before. Today, Triangulum consists of 23 partners, five of which make up the local partnership in Stavanger. 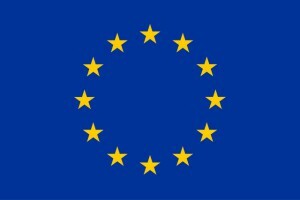 Together, partners will demonstrate “first-of-a-kind” solutions that help respond to the EU’s 7 stated societal challenges. The project has been running for already five years and ends in 2020. The City Council of Prague 7, together with the mayor Mr Cizinsky, has analyzed the feasibility study conducted within Triangulum and its proposed measures. On 15 June, the City Council of Prague 7 officially approved the feasibility study of the Smart Home Care pilot project. The City Council appointed Mrs. Marcela Janečková to coordinate activities that would lead to the prioritisation and implementation of the proposed measures in the near future. The councilor of the social area, Jakob Hurrle, has been appointed to oversee the involvement of the municipal organisation of Prague 7 and the implementation of the proposed measures. Members of IPR Prague, representatives of Prague 7 and representatives from the Czech technical university will participate in a training organised by LYSE and Stavanger and they will attend Nordic Edge conference. The aim is to pilot a project testing LYSE’s BLINK video communication tool in the context of the District of Prague 7.